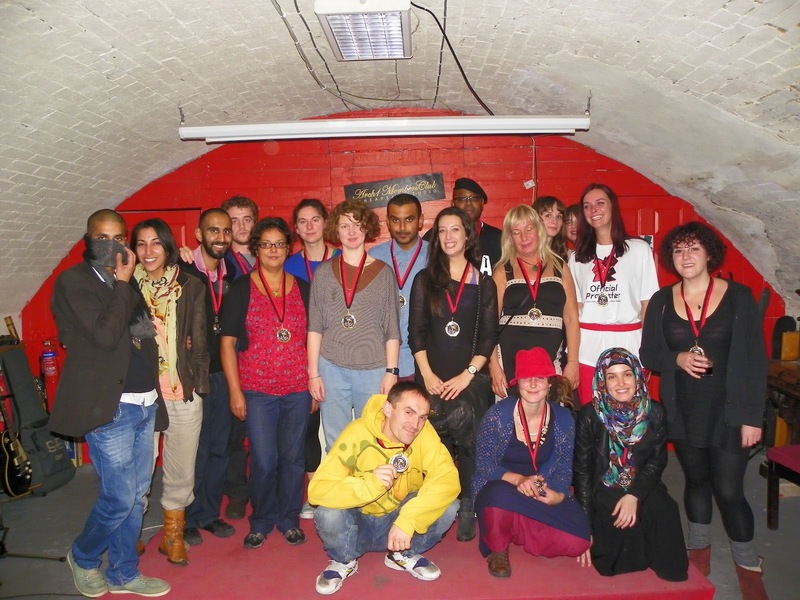 On Saturday, I attended a really fun celebration, at The Arches in Canning Town, of the work carried out by Community Legal Observers (CLOs) organised by Newham Monitoring Project during this summer's Olympics. It included a first look at some of the key trends that emerged from the evidence they gathered, which the organisation plans to document in more detail in a forthcoming report and resource aimed specifically at young people. The event also meant that CLOs could also receive a surprise memento of their volunteering during August and September - a medal bearing the famous 'human rights salute' protest by Tommie Smith, John Carlos and Peter Normal at the 1968 Mexico Olympic Games. As Newham Monitoring Project's Director Estelle du Boulay explained on Saturday, the evidence collected by CLOs paints a very different picture to the overwhelmingly upbeat impression of Olympic policing painted by the Association of Chief Police Officers. Away from the main venues, on side streets and estates, young people in particular complained of the excessive use of stop & search powers by officers who were often rude and aggressive, as well as incidents involving illegal strip searching in the backs of police vans. A number of young people chose to avoid Stratford altogether or made sure they travelled in groups no larger than two, for fear of the dispersal zone restrictions in place. CLOs also reported consistently positive feedback from local people to the rights cards that NMP distributed and a belief that basic civil liberties still needing protecting, even when an event as huge as the Olympics was taking place. However, there were reports that people arrested were denied the right to call NMP's 24-hour emergency helpline and cases of threatening and intimidatory behaviour by individual officers towards volunteers who were observing the policing .of the Games.